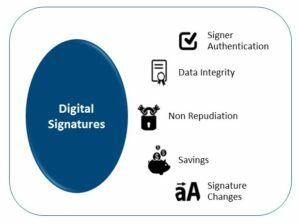 Digital signatures ensure that documents don’t get changed. A document that has been changed will make the digital signature invalid. Think of the document as a “lock” and the signature as the “key”. If you edit the document in anyway the “key” will not fit the updated “lock”. Only the signer can sign the relevant documents as they are the only one with access to a private key used to apply the signature. There is no way that a signer can claim that their signature has been forged by another party due to the keys in asymmetric cryptography (the public and the private keys) 2. This makes it easy for digital signatures to stand up in court. With digital signatures, there is less need for paper, ink and postage. Many companies and organizations save records electronically, reducing the need for storage space. Electronic signing and filing also saves time, as there are fewer trips to the printer, the mailbox and the storage file. Is your current signature exactly the same as it was when you were 19? Is your signature noticeably different every time you sign it? Familiarity breeds contempt, even for these tiny little things. Do you remember the last time you got a new phone? You were so cautious and careful… but three months later, you’d started throwing it on the bed. The same happens with your signature, but yet you want some peace-of-mind that, years down the line, you can still be sure of what you did and didn’t authorise. Still don’t believe me? Have you ever wondered why all of your ATM transactions are managed by a pin number, and not a wet signature? How does this relate to Registered Communication services? All our registering services provide our users with a digitally signed certificate from a trusted third party, showing the full chain of custody of the communication, whether it is a Registered Email or an eContract signed online. These services are essential in industries that rely heavily on communication logs for auditing and compliance.